Think chemical energy is dull? 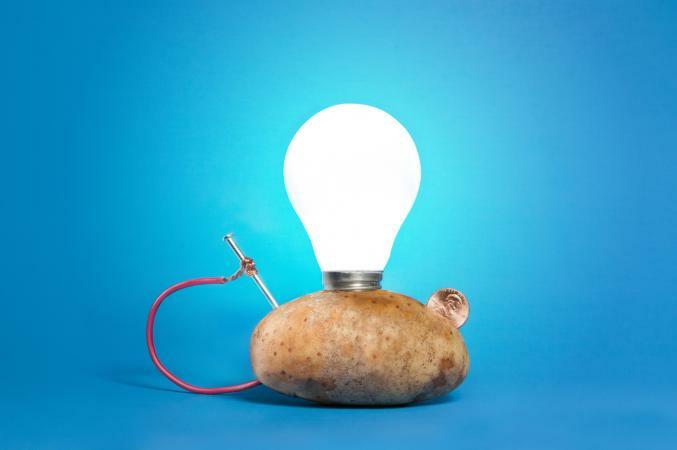 Think again with this cool project that lets you turn a potato into a battery. The project is perfect for ages five and up, although younger children will need adult supervision and help to work with the nails and wires. This potato battery is a great activity to discuss the transfer of energy, from chemical to electrical energy. It takes about 15 to 20 minutes to complete from start to finish. Cut out a penny-sized hole inside of a raw potato. Strip one end of a copper wire. Tie a copper wire around a penny, making sure the stripped end is touching the copper. You should wrap the wire around the penny a few times. Place the penny and copper wire unit in the hole of your potato. Pierce the potato with a galvanized nail, in the opposite side of the potato as the penny. Do the same thing with another potato, penny, copper wire, and galvanized nail. Place the two potatoes side by side. Wrap the copper wire from one potato around the galvanized nail of the other potato. So now you've made your potato battery, but what should you do with it? There are a variety of things you can do to see if your battery works and how it might be used. Use a multimeter - A multimeter measures voltage - so you can measure voltage by touching the multimeter's probes to the nail or penny. Use your potato to power something. You can use LED lights, a light bulb, a simple clock, or anything else small that requires a battery. Keep in mind a potato battery isn't strong enough to power anything large. This is easiest to do if you use alligator clips to help connect your battery to the battery terminal of a small device. There are a few variations you can try with this experiment. All of them are appropriate for any age. However, small children will require adult help. Add more potatoes (with pennies and galvanized nails in them) to increase your voltage, by attaching the potatoes to each other with copper wires (see video). Try boiling or cooking the potato first to see if this increases the output or voltage. Try the experiment with a lemon or an orange. The reason potato batteries work is because chemical reactions are taking place, and changing chemical energy into electric energy. Teach Engineering notes potatoes create an electrolyte solution. This means they provide electrons with a place to move to copper and zinc (and back to copper) to complete circuits. The potato itself acts a buffer between the copper and zinc during electron transfers. The potato battery experiment provides an excellent way for kids (and adults) to learn more about science. Now that you've made a potato battery, you know more about how a circuit and electricity works.